Inject locally, treat globally. That’s the gist of a new cancer immunotherapy strategy called in situ vaccination. It has three steps: (1) Deliver immunoenhancing agents to a tumor site. (2) Trigger an immune response among “prescreened” T cells, that is, T cells that have already shown that they can infiltrate the tumor. (3) Watch the T cells attack cancer throughout the body. In situ vaccination was developed by Stanford University scientists who believe that their approach, which involves local application of tiny amounts of immunoenhancing agents, could serve as a rapid and relatively inexpensive cancer therapy. These agents? An innate immune system activator called CpG, and a stimulatory antibody called anti-OX40. The scientists, led by oncologist Ronald Levy, M.D., also emphasize that their approach is unlikely to cause the adverse side effects often seen with body-wide immune stimulation. 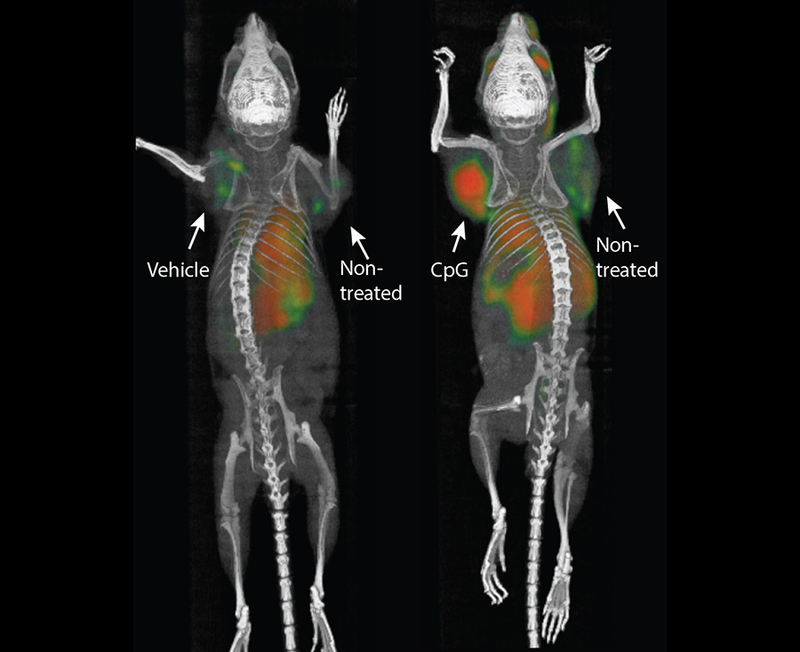 Details about the new approach appeared January 31 in the journal Science Translational Medicine, in an article entitled “Eradication of Spontaneous Malignancy by Local Immunotherapy.” The article describes how in situ vaccination was tested in mice with transplanted lymphoma tumors in two sites on their bodies. Just one tumor was injected with the two test agents, but both the treated and the untreated tumors regressed. In 87 of 90 mice, the cancers were eradicated. Although the cancer recurred in three of the mice, the tumors again regressed after a second treatment. The researchers saw similar results in mice bearing breast, colon, and melanoma tumors. “I don't think there's a limit to the type of tumor we could potentially treat, as long as it has been infiltrated by the immune system,” Dr. Levy stated. Some immunotherapy approaches rely on stimulating the immune system throughout the body. Others target naturally occurring checkpoints that limit the anticancer activity of immune cells. Still others, like the chimeric antigen receptor (CAR) T-cell therapy recently approved to treat some types of leukemia and lymphomas, require a patient's immune cells to be removed from the body and genetically engineered to attack the tumor cells. Many of these approaches have been successful, but they each have downsides—from difficult-to-handle side effects to high cost and lengthy preparation or treatment times. Cancers often exist in a kind of immunological limbo. Immune cells like T cells recognize the abnormal proteins often present on cancer cells and infiltrate to attack the tumor. However, as the tumor grows, it often devises ways to suppress the activity of the T cells. Dr. Levy's method works to reactivate the cancer-specific T cells by injecting microgram amounts of two agents directly into the tumor site. To explore the specificity of the T cells stimulated by in situ transplantation, the study’s lead author, Idit Sagiv-Barfi, Ph.D., transplanted two types of tumors into the mice. She transplanted the same lymphoma cancer cells in two locations, and then she transplanted a colon cancer cell line in a third location. Treatment of one of the lymphoma sites caused the regression of both lymphoma tumors but did not affect the growth of the colon cancer cells. One of the agents is currently already approved for use in humans; the other has been tested for human use in several unrelated clinical trials. A clinical trial was launched in January to test the effect of the treatment in patients with lymphoma.